SHAH ALAM (Oct 1): The Selangor state government will table a bill to cut the salary and trim the scheduled allowance hike of the Mentri Besar, executive councillors, speakers and deputy speakers in the coming state assembly session in November. 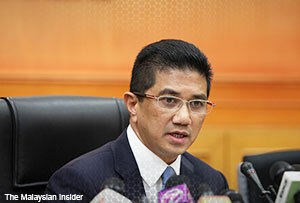 The newly-appointed Mentri Besar Mohamed Azmin Ali said the hike that was passed in Nov 22, 3013, should be reviewed to be in line with the responsibility and services of the four positions. However, the salary and scheduled allowance hike of the state elected representative would not be affected, he said. "We feel that the rate of the salary and allowance hike for the state assembly person is reasonable, as it is in line with their responsibility and service," Azmin told a press conference, after he chaired the first exco meeting here. The salary and scheduled allowance hike of the Mentri Besar, Exco members, speaker and deputy speaker has escalated into a controversy, as Pakatan Rakyat leaders have been questioning the massive pay rise up to nearly 400%. Under the new salary structure, the Selangor Mentri Besar's monthly salary will jump 106.4% to RM29,250, from RM14,175, while the salary of exco members will increase by 231% to RM20,250, from RM6,109.29. Meanwhile, the Speaker' pay will increase by 268% to RM22,500, from RM6,109.29; and the deputy Speaker to RM15,750, from RM3,327.50 (a rise of 373%). Meanwhile, the pay of assemblymen will increase 87%, from RM6,000 to RM11,250 a month. When bombarded by reporters on other pressing issues, Azmin said the state government has yet to look at the agreements on the controversial toll highways such as Kinrara-Damansa Expressway (Kidex), as the water agreement was given top priority. "We will review all the agreements, so that this take into account the issues of connectivity, interest of the people; but we have yet to look into this [the highway agreements]," he said. He also said a special briefing on the water consolidation agreements by Kumpulan Darul Ehsan Bhd (KDEB), will be held tomorrow. In the brief press conference, Azmin has also responded to questions on the position of Datuk Seri Anwar Ibrahim as Selangor’s economic advisor. He said the previous exco meeting chaired by his predecessor Tan Sri Khalid Ibrahim, had decided to close down the office of the economic advisor. "We will discuss again on the function and role of the economic advisor in economic development. Surely we will provide facilities, including office, in line with the role that is going to play by him [Anwar]," Azmin said.